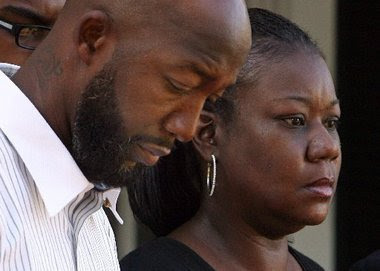 The parents of Trayvon Martin and their attorney stop by Roland Martin's show Washington Watch and discussed and the events surrounding the death of their son. The parents are also calling for the FBI to intervene into the case because they no longer trust the local police department. May God bless them and strengthen them. I am glad they are getting the airtime they need to tell their story and seek justice for their son. But I cannot imagine how hard this must be to relive with every interview. It seems to me that if this guy truly had a self defense story he and the police good give a sufficient account as to what has happened and this family would not be left wondering. Apparently they do not have any real details to share because there was no real threat. Other than the actual threat he posed upon this young innocent unarmed man by his needless pursuit.